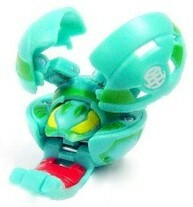 Bee Striker is a massive Bakugan with gigantic wings and a huge stinger. It is a sleekly dangerous fighter with a lethal sting used to great effect against opponents. Bee Striker uses its large wings to create a massive tornado to blow away and defeat its enemies. With it's ability to fly, it can do fast reflexes like dodging attacks. It's abilities may be small, but in battle, it can be a tough customer with it's stinger! Purchase Bee Striker from Amazon now!